I don't really know how I feel about having these photo's on the internet, but then again I am just in a bikini and everyone posts themselves in a bikini from their holidays, so what difference does it really make? I was eager to do a bikini post after buying two that I adore from New Look, the all in one swimsuit and the high rise bikini. I knew I wanted a all in one suit as I thought it made a nice change from the typical two piece. The cut outs was also a extra detail in this swimsuit that I loved and felt like it was something Missguided would sell. I also knew I wanted a bikini that was more high up on your waist. Every year I eye up one from Topshop but when it was around June / July time my size was always out of stock and this is the reason for grabbing one NOW. This one also had a bit more to it then the standard black one I used to see in Topshop. It also has a mesh effect on the bikini bottoms. I know that three black bikini's may be a bit too over the top but I promise that if I buy another it will be a colour one (well white.. ) I have blogged about my triangl bikini here. I think I am going away twice this year. Costa Del Sol with my family and then somewhere in September with my boyfriend hopefully. I have not been away on holiday properly since 2011! How crazy is that. I chose to go to Festivals instead but now I need sun, sea, sand and cocktails desperately. Maybe this post is a tad early in the year, but I think if you don't start preparing for your holidays asap, then all the good stuff goes fast. In August shops will be probably be preparing for winter again. 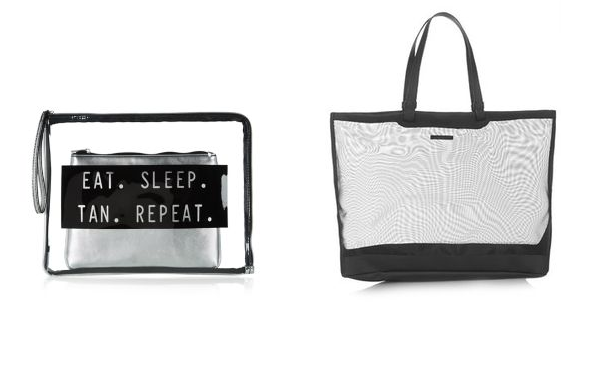 In the future I will do a holiday wishlist blog post where I will probably be lusting after particular items, just like I'm currently lusting after this Eat, Sleep, Tan, Repeat clutch from New Look and this Topshop mesh tote. Drooling. These bikinis are gorgeous...definitely wanting to go on holiday now! Love the second bikini so cool!